America’s favorite poster child for not winning American Idol and still coming out ahead of the actual winner is back. 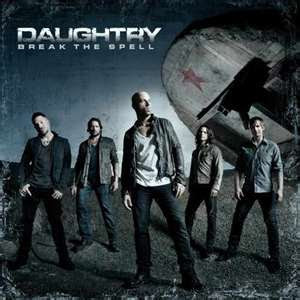 Daughtry has just released a new album entitled Break the Spell and it follows the “if it ain’t broke, then don’t fix it” formula fans expect from the band. That’s not necessarily a good thing or a bad thing. Daughtry first burst onto the scene as a contestant on American Idol in 2006. He was one of, if not the, first contestant who had a true passion for rock. Many fans of the show remember his shocking elimination from the final four on the show. You have to YouTube the clip and just look at the expression on his face and eventual runner-up Katharine McPhee. Chris went on to almost make a joke out of the show by selling more than all of the contestants combined from that season. His debut album sold over four million copies and produced numerous hits and his follow-up Leave This Town was also a hit. He has proven that he is not a flavor of the week and that he is serious about his music career. The band brought in Howard Benson again to produce for them. He has also produced Daughtry’s first two albums. A producer can bring a lot to the playing field for a band. A great producer will push a band and force them to think outside of the musical box. I have to admit than I am a fan of Daughtry and they have a formula that works for them. They do manage to break out of the “relationships on the brink of disaster” formula a few times on this album, but for the most part it’s sticking to that tried and true formula that sells millions for them. Is that a good thing or a bad thing? Well, I guess it’s open for debate with both sides holding valid points, but time will truly tell. “Renegade” kicks off the album with a big rock number. No, it’s not a cover of the Styx classic, but it definitely has an edge to it that they would be envious of. Next up is “Crawling Back to You”, which is the first video and single and textbook Daughtry. “Outta My Head” is another catchy, rocking number with a hint of Bon Jovi . “Start of Something New” is a mid-tempo, acoustic flavored ballad that will most certainly draw comparisons to “Home”, but it’s still one of the strongest songs on the album. An artist always wants to connect with the listener and make them feel what they are singing. “Gone Too Soon” is an excellent example of one of those songs. A powerful and emotional song of a lost child and the grief the parents are going through as they think “what if”. This is one song that will definitely tug on the heart strings of the listener. Chris dabbles a little bit in the field of falsetto on the song “Rescue Me” and pulls it off like a pro. What’s the lyrical content of this one? You guessed it, another wounded relationship song. “Spaceship” closes out the regular edition of the album; a standout track on the album about love and a romantic escape and proving that even adults who rock and roll for a living can still daydream. I think Break the Spell is a really good album with a few standout tracks that show the band branching out. Is it a great album? Well, I am sure most diehard Daughtry fans will give a big “HELL YEAH” to that question. I just wish there was more growth or experimentation from the band, whether in lyrical content or musical direction. That is needed from any band to be able to make their career in the industry a marathon rather than a sprint.